As we reported earlier, Microsoft will stop supporting the Windows XP operating system after 8th April, apparently 95% of the world’s 3 million ATM machines are run on it. Microsoft's decision to withdraw support for Windows XP poses critical security threat to the economic infrastructure worldwide. Security researchers at Antivirus firm Symantec claimed that hackers can exploit a weakness in Windows XP based ATMs, that allow them to withdraw cash simply by sending an SMS to compromised ATMs. "What was interesting about this variant of Ploutus was that it allowed cybercriminals to simply send an SMS to the compromised ATM, then walk up and collect the dispensed cash. It may seem incredible, but this technique is being used in a number of places across the world at this time." researchers said. According to researchers - In 2013, they detected a malware named Backdoor.Ploutus, installed on ATMs in Mexico, which is designed to rob a certain type of standalone ATM with just the text messages. 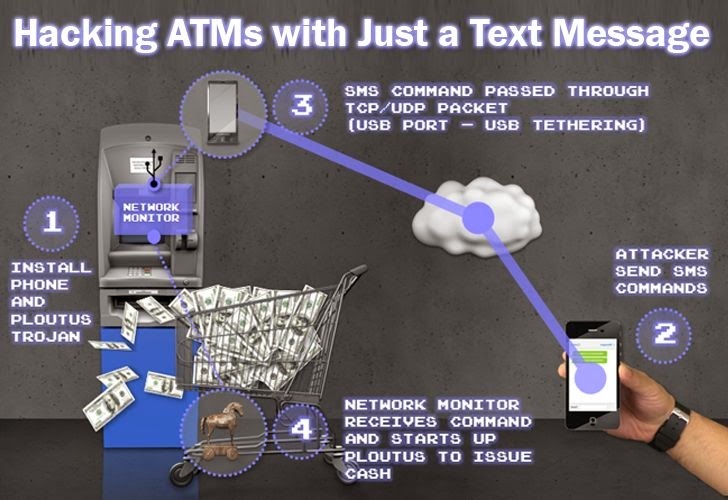 To install the malware into ATMs machines, hacker must connect the ATM to a mobile phone via USB tethering and then to initiate a shared Internet connection, which then can be used to send specific SMS commands to the phone attached or hardwired inside the ATM. "Since the phone is connected to the ATM through the USB port, the phone also draws power from the connection, which charges the phone battery. As a result, the phone will remain powered up indefinitely." The attacker sends two SMS messages to the mobile phone inside the ATM. Finally, the hacker can collect cash from the hacked ATM machine.